This Tonopah hotel offers a continental breakfast, fresh baked cookies and a relaxing seasonal hot tub spa. 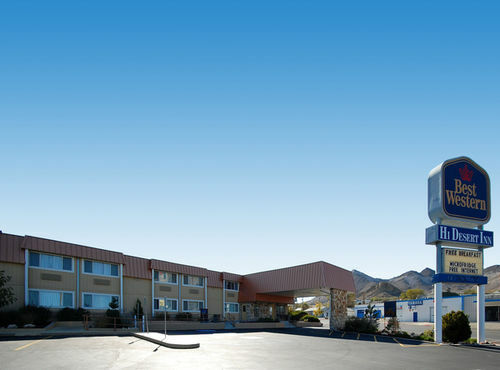 The Best Western Hi-Desert Inn is located in the historic mining town of Tonopah. The hotel is close to local casinos, the Central Nevada Museum, round mountain gold mine and Yosemite National Park. Hotel guests will find an attentive staff providing excellent customer service. Each well-appointed room features cable satellite television and free long distance access. Business suites feature microwaves, refrigerators and free high-speed internet access. Hotel guests will enjoy an outdoor pool and seasonal spa, courtesy airport shuttle and complimentary continental breakfast. Pets are welcome. A friendly staff is ready to ensure a comfortable and memorable stay.